Football in Bangalore: Bops the official Bengaluru FC fan! Bops the official Bengaluru FC fan! This is what happens when you have a player in boss, and that too a National tennis player. Mustafa Ghouse, CEO, JSW Sports played competitive tennis till a few years ago. 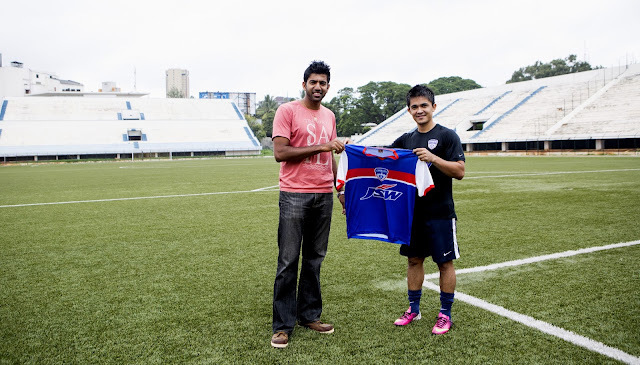 Today his former colleague dropped in to the Bangalore Football Stadium today. His colleague is none other than World No. 3 doubles tennis player Rohan Bopanna! Boppanna came to see the pre-season practice of the Newly for Bengaloru FC. He was presented with a club shirt by the Indian national team striker while the tennis star handed Chhetri a signed racquet. "I’m a huge fan of the game and irrespective of what team is playing, if there’s football on television, I’m always glued. So, to have a team in my home city is just fantastic.” Boppana said. He also added, "I’m going to have some free time in November and I’m going to make it a point to be at the stadium in my club shirt to cheer the team at games. I’m an official fan now!" This team definitely has some strong tennis connection! Renowned strength and conditioning coach and trainer of Sania, Bhupathi, and Bopanna, Shyamal Vallabhjee is working with Bengaluru FC team in their pre-season. A visit like this is most certainly welcomed and definitely makes for good television viewing!